Massive Open Online Courses (MOOC) – free and open online courses offered by worldwide leading Universities have attracted much attention (one might even say social panic) amongst higher education (HE) circles and beyond since their rising popularity in 2012. For many here there was not only aseemingly radically new technology that once unleashed would have had unstoppable consequences for the educational sector, but perhaps equally urgent realisation that these anachronistic and old institutions called universities had been resisting to the “New Media revolution” (Manovich) for far too long and that a creative destruction of the entire sector was imminent. MOOCs would give everyone with Internet access collective access to high quality education offered by esteemed universities free of charge and without any entry requirements. On the plus side this would lead to a global democratisation of education, but on the negative side giving away Ivy League education to anyone in the world for free would put a lot of Universities that cannot afford to do so under pressure and possibly out of business, so that ultimately there will be only be a handful of institutions left. However even though more MOOC platforms were launched in the past 2 years e.g. FutureLearn in the United Kingdom and iversity in Germany, and more universities got involved, the apocalypse did not happen. Instead many of MOOCs’ limitations, both in terms of their pedagogy and their sustainability, crystalized. For instance, MOOCs were not able to replace the “university experience”, which goes beyond the mere absorption of ‘packets of knowledge’, nor were they able to significantly democratise education. In addition, the lack of robust business models tied to certification and accreditation put their long-term viability into question. Not only have MOOCs been written off as being just another technology undergoing a hype cycle, but also post mortem Wikipedia entries have been written. Yet, irrespective of the question whether MOOCs will fundamentally change higher education, I think that they already had an impact just for the mere fact that they have put a series of crucial questions concerning higher education, ranging from issues of access to issues of value, in the spotlight. One matter that in my view would merit some more attention is the role of new media in higher education. Is New Media a driver for innovation in teaching? Having been a media student for more than three years I can attest how poorly technology is often employed in higher education institutions: media is, across the board, used either as an administrative tool or a repository for old content-forms delivered over new media channels e.g. downloadable pdf readings and course guide lines, which do not exactly correspond to my imagination of “new“ media. I don’t want to suggest that MOOCs are radically new medium in terms of their pedagogy, and the more popular xMOOC format certainly is far less progressive then George Siemens’ connectivist learning theory, Coventry Universities open classes or the infamous open digital storytelling course DS106. However MOOCs in their present form are forcing the people involved to think and shape their pedagogy in medium-specific ways, and to experiment with concepts such as the flipped classroom. Coupled with the media attention MOOCs have been receiving from the press, they could be an important driver for innovation and the use of technology in teaching for the next years to come. In fact, throughout my research of universities and academic’s motivations to get involved in MOOCs, teaching innovation has been cited as a major reason for getting involved. The University of Nottingham for example, a truly transnational university with campuses in the United Kingdom, China, and Malaysia, has been using their MOOCs experience to improve on the on-campus learning experience and to foster increased cohesion and collaboration across campuses. If successful, this will offer new possibilities of intra-campus learning experiences, synchronous courses offerings across all three campuses and, perhaps most importantly, opportunities for students to shape their digital participatory literacies which will be an important skill set in future research environments. Similarly, the use of new media to move part of the content delivery to the virtual can also be beneficial for smaller institutions to increase efficiency by offering a greater course selection whilst avoiding timetabling issues. To conclude, MOOCs won’t, at least in the short term, dramatically change higher education, but due to their format and public nature they are forcing those institutions involved in MOOCs to rethink their pedagogy in relation to the Internet. I doubt that throughout my Master studies I will witness any radical changes in the pedagogy I will experience, but I am hopeful that new media will play a more important role in education in the not too distant future. BIS. 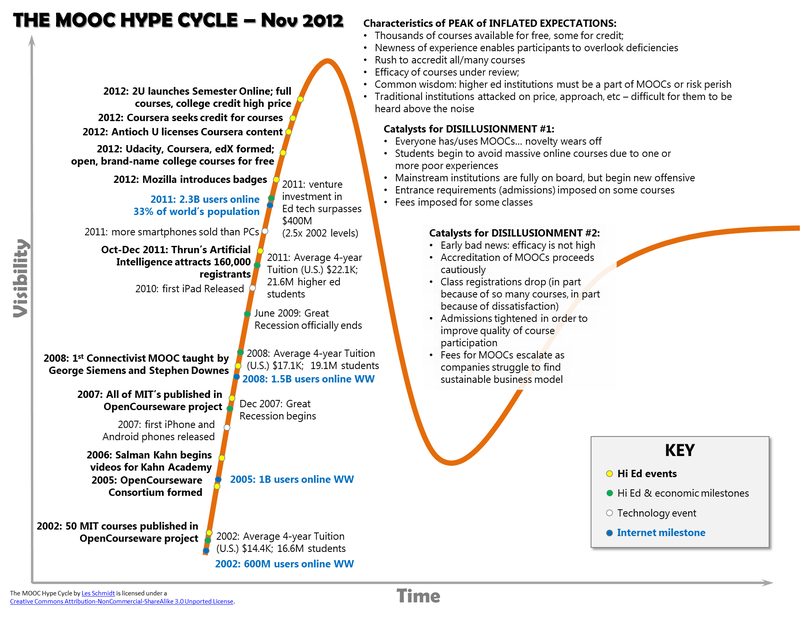 The Maturing of the MOOC. Department for Business, Innovation and Skills, 2013. Print. This is an excellent literature review of what has been published about MOOCs in the past three years. Provides critical commentary on the MOOC phenomenon and the UK higher education sector. 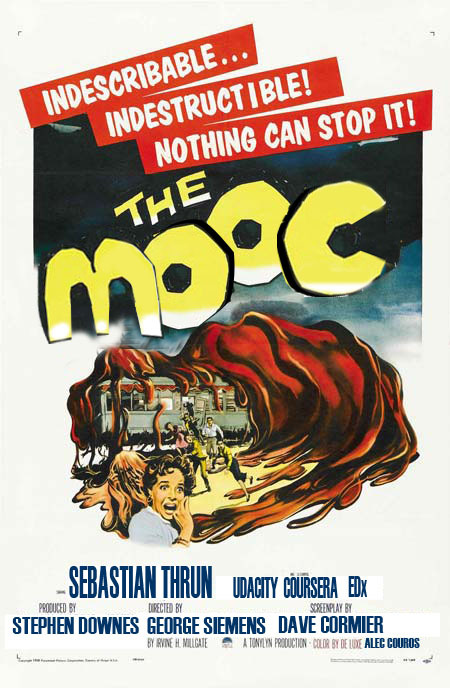 MOOCs: nothing more than the latest craze… or are they?